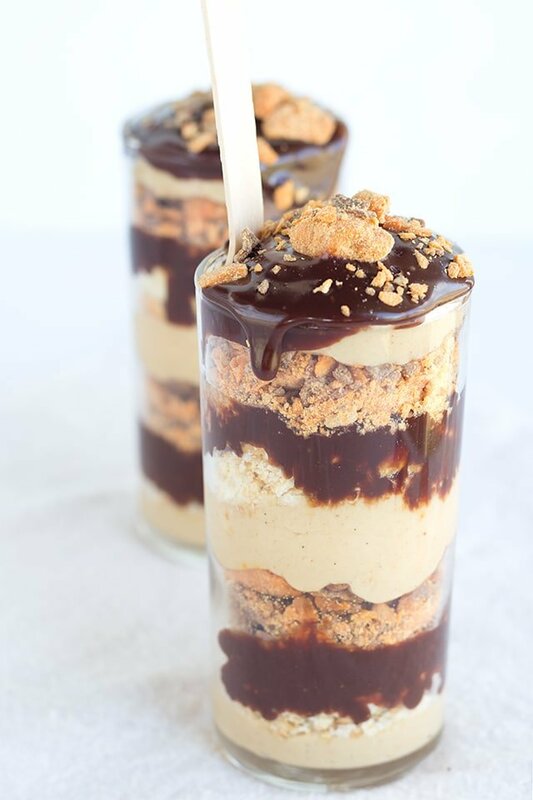 It’s time for the peanut butter bash again and I made some chocolate peanut butter crunch trifles for the party. The theme this month was peanut butter and ritz crackers. I wasn’t quite sure what I wanted to make. I thought long and hard about some kind of peanut butter cracker bark but eventually decided against it and I don’t regret it one bit. Not that that wouldn’t make an amazing recipe, but because these trifles were loved by all. 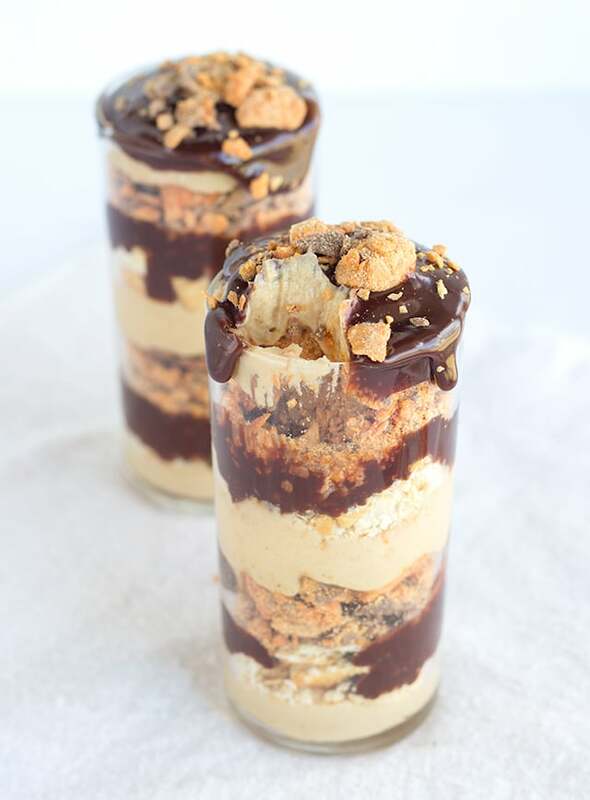 The salted, buttery crackers and butterfinger bits stepped up the game for these crunch trifles. I almost always make a peanut butter cream cheese mousse for the trifles, but I wanted to switch it up this time. I spun my lazy susan around searching for ideas and BAM! I came across a box of white chocolate pudding. Yep, that’s the sign. Peanut butter pudding it is. I loveeee butterfingers. love ’em to pieces. I’m so pleased that I thought to include them in this recipe to add another crunch factor to go along with the crackers. So, the layers are in this order. 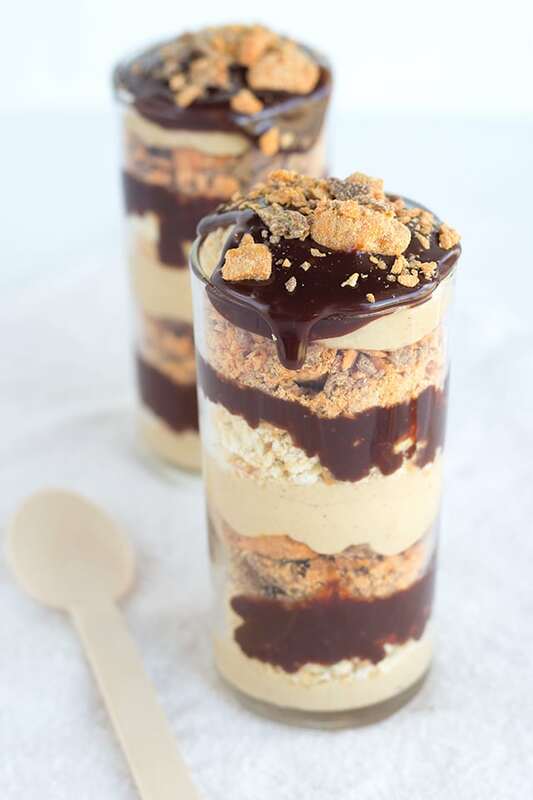 Peanut butter pudding, crushed ritz crackers, milk chocolate ganache, Butterfinger bits and repeat. Easy enough, right? In a mixing bowl, add in the white chocolate pudding mix and milk. Whisk for 2 minutes until it's thickened. Add in the peanut butter and vanilla extract. Beat with a hand mixer until completely incorporated. Place in a disposable piping bag and set aside. You could also spoon it into your trifle cup if you don't have a piping bag. In a microwave-safe bowl, add in the chocolate chips and heavy cream. Microwave for 45 seconds. Stir. Microwave for an additional 30 seconds and stir until smooth. If there are still lumps. you will need to microwave another 30 seconds. Pipe the peanut butter pudding in the bottom of the cup or bowl. Add 1 - 2 tablespoons of ritz crackers on top of the pudding. Pour a layer of ganache and tap it to cover all the crackers. Add 1 - 2 tablespoons of Butterfinger baking bits. Sprinkles Butterfinger bits to the top of the trifles. Bloggers, do you want to join in on the peanut butter bash fun? If so, email me at [email protected] and request to join the Peanut Butter Bash facebook group! The first Thursday of each month we post a dessert/sweet with peanut butter and a mystery ingredient. This month’s ingredients were peanut butter and ritz crackers. Here are the other peanut butter and ritz cracker creations! Peanut Butter Jelly Bites from Gina of Kleinworth & Co. I LOVE using Ritz in desserts – SO good. 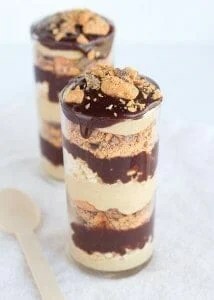 these look amazing, cannot wait to make! might be dessert tonight, ha! These look DELICIOUS! 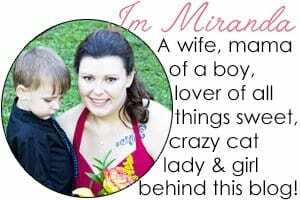 Found you on the Project Inspirated link party, pinning to try later. Holy goodness, those look rich and so inviting. Gorgeous presentation as well! Thanks for linking up with Delicious Dishes Recipe Party! Looks scrumptious! A Saturday must make sweet treat! Thanks for sharing!